Updating and upgrading your building’s commercial HVAC system is one of the smartest investments you can make. Updating and upgrading your building’s commercial HVAC system is one of the smartest investments you can make. When you do this, you can take advantage of the latest technological developments that didn’t exist when your system was originally installed or configured. Here is a better look at why you should consider retrofitting your commercial HVAC system this winter. 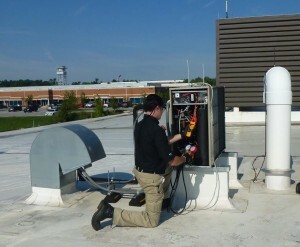 Keeping your commercial HVAC system running smoothly is much easier when you work a preventative maintenance partner. This upkeep helps minimize the incidence of problems such as downtime when your business is closed because the HVAC unit is down. Winters on the East Coast can be bitterly cold, especially in Maryland. When your HVAC is up and running, it can distribute heat all over your building and then switch to cool the building down once spring and summer return. No matter what time of year it is, your commercial HVAC also works hard to improve the indoor air quality of your building, which can, in turn, help reduce the possibility of sick building syndrome. Retrofitting will allow you to modify or alter the components that no longer work as well while leaving higher-performing parts intact. This can extend the lifespan of the system, and allow you to comply with industry and government regulations concerning the refrigerant used in the HVAC system. One way to complete the retrofit is by changing out the refrigerant. Freon is no longer used, which means it’s time to replace it with a different liquid. R-22 refrigerant is also on the way out, so if that is used in your system, then a retrofit can get rid of it. Switching to a different type of refrigerant also means that some upgrades and tinkering will be needed to make sure that everything can operate without a problem. Another way to complete the retrofit is by changing the thermostat. Replacing the pneumatic thermostat with a wireless one can help improve your building’s energy efficiency. Plus, it makes it quicker and easier to track temperature changes throughout the day, receive notifications of any issues, examine diagnostic reports, and then instruct the system to calibrate itself without your input. This entry was posted on Wednesday, January 16th, 2019	at 10:37 am	and is filed under Efficent Commercial HVAC Systems . You can follow any responses to this entry through the RSS 2.0 feed. Both comments and pings are currently closed.